Pepsi Marinated Chicken Wings? We've got Cheesy Lobster in China too. Sitting in what's often called a trashy cafe in Beijing's Wudaokou district, a friend of mine asked me a question, "你知道为什么中国网游那么简单吗？" (Do you know why Chinese online games are so simple?) Confused and halfway through a soggy "homemade" microwave potato chip I asked, "Why?" My buddy smiled at me and said, "Because they're designed to be played with one hand cause the majority of the players smoke while they play." Not being a smoker, and being an eater, I believe that Chinese MMOs being single handed games are also a boon for snacks, such as potato chips. Potato chips in China aren't exactly a new or revolutionary snack but recent forays into the science of the spud has made them more than just a simple potato chip, more like the wonder gum found in Willy Wonka's Chocolate Factory. 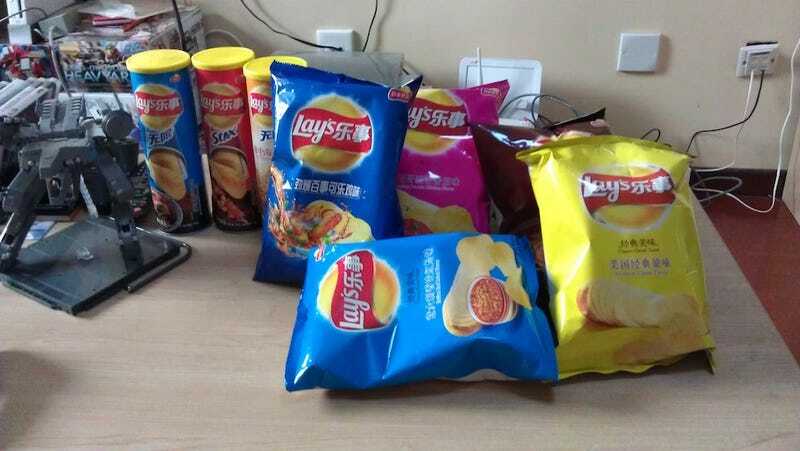 Chinese potato chips come in a variety of strange and wacky flavors that may either shock or delight any foodie, and today we'll take a look at Lays and their strange and wonderful offerings, everything from the classic potato chip to the much hyped "Pepsi marinated chicken wing flavor". Frito-Lay's a subsidiary of Pepsi Co. currently offers at least 20 different flavors (sans repeats in different packaging and Cheetos). Unfortunately I was only able to purchase 10 flavors. The first flavor I tried was the traditional "Classic" chip (or crisps as my British neighbor keeps correcting me). The bag was marketed as the "American Classic Flavor," and it lives up to the name in nearly every aspect. It tastes exactly like the Lays found in the US, a salty greasy potato chip. Nothing really to write home about, the only reason I felt compelled to add it to the list was to give a comparison. I followed the classic with the "Finger Licking Braised Pork Flavor". Unfortunately there wasn't very much pork flavor, it tasted more of a sweet soy sauce type of flavor. Having eaten braised pork in Taiwan and the Chinese mainland, this chip is really weak in the braised pork flavor. The "Sizzled Barbecue flavor" was also quite lacking. There wasn't much meat flavoring, not much sizzle, just a slight spicy taste of Chinese 5 spice powder, a spice mix often found on Chinese meat skewers that are sold on the streets. "Mediterranean Roast Chicken" was arguably my favorite chip of them all; the taste actually resembled chicken. Unfortunately I'm not sure what Mediterranean roast chicken should taste like so I can't make any further judgements. The smell, the taste were all pretty spot on for chicken. I can still smell it now as I type on my keyboard with greasy chip covered fingers. The "Mexican Tomato Flavor Chicken" also tasted like chicken, but was heavy on the tomato. I felt like I was eating chicken doused in ketchup. I wonder if this is what the Chinese think Mexican food is. The tomato flavor is overwhelming and the smell hits you before you bite down. I wasn't a big fan of the reddish orangy color. My least favorite chip of the lot was the "Cheesy Lobster". It was downright disgusting. The Chip tastes like fish and not in a good way. It brought me memories of living in LA and eating Sushi at Todai... the sushi wasn't very fresh—and the taste of the "Cheesy Lobster" was definitely not fresh, either. Seeking to get rid of the taste of the "lobster" in my mouth I went with the "Texas Grilled Barbecue Flavor". The taste was very close to beef, if the beef flavor found in cup noodles was the real beef flavor. I don't know what's Texas about the chip. Perhaps it's that the chips were huge in this bag, though that might have had something to do with my dog not crushing the bag. The "Italian Red Meat Flavor" was just super bland. On the bag there was a bowl of what looked like bolognese sauce. The chip tasted nothing like it. Luckily because the "Italian Red Meat Flavor" was so bland the "Numb and Spicy Hotpot Flavor" seriously surprised me. The chip was definitely spicy and numbing, but apart from that I couldn't tell that it was hotpot—of course that's just me wanting more flavors, like maybe spicy mushroom, spicy beef, all the ingredients that go into spicy hotpot. I was told that this was the flavor that replaced "Spicy Fish Soup". I'm willing to bet the "Fish Soup" was too fishy so they went with just "Spicy and Numbing". Finally, I saved the most controversial chip, the "Pepsi Marinated Chicken Wings" for last. This chip made a big splash in the news last December for being so uniquely weird. At the time, I was too busy to sit down and actually to write about it. This chip is something else, something different, almost something that I wouldn't call a potato product. The smell is almost medicinal, the taste is strange—at moments there is the Pepsi flavor, at other moments there is the taste of chicken, but it doesn't feel right. There is a strange peppery feel when it goes down. It almost tastes like a science experiment gone wrong. Nowhere near the delightfully sweet and sour flavor of real cola marinated chicken. Frito-Lay's Chinese offerings are, for the most part, pretty good. Like the Oreos offered in China, the flavors put out by Frito-Lay's is aimed to placate all Chinese palates possible. After eating so many chips, I feel a sudden case of dry mouth. I'm in need of some DayQuil and water.